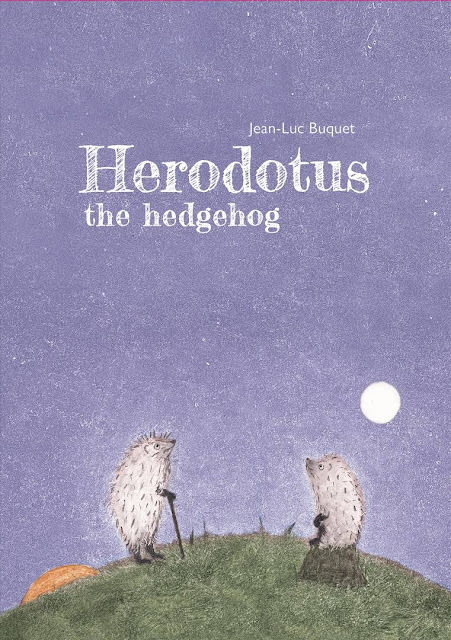 With monotypes of sky, forest, and animals, artist Jean-Luc Buquet tells the story of an endearing little hedgehog named Herodotus. Herodotus is in search of the truth, traveling from one animal to the next, learning about each animal’s Great Spirit. He hears about the Mighty Spirit Bear, and the Great Fox. He wonders if hedgehogs have a Great Spirit too. An old hedgehog named Venerable tells Herodotus that the only thing certain is “the sun rises, and then it sets.” For Venerable this knowledge is enough. But Herodotus just thinks Venerable is “getting really old” and continues his quest. He meets a weasel, sheep, and a wolf. All of them have Great Spirits. Then a hoopoe tells him that there is only one Great Spirit. Watching the hoopoe argue with a raven, Herodotus is even more confused. Closing his eyes he feels that his Great Spirit, the Great Hedgehog, might be there. But when he opens his eyes he sees wise old Venerable. In the end, Venerable and Herodotus are at peace, watching the sun set and the moon rise. Herodotus the Hedgehog is an eloquent story about mystery and uncertainty.